Save Flex Project... Recovers the Flex project from the selected input SWF. The program will create a new folder (named "FlexProject_" plus the source SWF filename - "MyFlex.swf" would lead to a folder named "FlexProject_MyFlex") within the selected destination folder. After recovering a Flex project you have to import it with Adobe Flex. In Adobe Flex Builder 2, choose "Import..." from the File menu, select "Existing Projects into Workspace" in the Import dialog, press the "Next >" button, select the "Select root directory:" option and press the "Browse..." button to the right. In the Browse For Folder dialog select the created "FlexProject_(SWFNAME)" folder as root directory and press the "OK" button. Press the "Finish" button in the Import dialog. In Adobe Flex Builder 3, choose "Import -> Flex Project..." from the File menu, select the "Project folder:" option and press the "Browse..." button to the right. In the Browse For Folder dialog select the created "FlexProject_(SWFNAME)" folder and press the "OK" button. If you don't want to create an extra copy of the recovered files in your Flex default location, uncheck the "Use default location" checkbox in the Import Flex Project dialog. Press the "Finish" button in the Import Flex Project dialog. 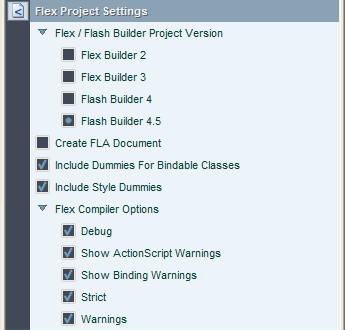 In Adobe Flash Builder 4 / 4.5, choose "Import -> Flash Builder Project..." from the File menu, select the "Project folder:" option and press the "Browse..." button to the right. In the Browse For Folder dialog select the created "FlexProject_(SWFNAME)" folder and press the "OK" button. Press the "Finish" button in the Import Flash Builder Project dialog. Cannot create HTML wrapper. Right-click here to recreate folder html-template. Right-click and select Recreate HTML Templates from the popup menu. Flex Project Version decides the file format of the recovered documents. Make sure to select the correct option as a false framework version may cause compiler errors and warnings (for example, a newer framework interface version might require you to create additional function implementations). Create FLA Document allows you to create a FLA document (named "OtherElements.fla") that stores the media files (sounds, pictures and videos) and graphical elements (such as MovieClips, Shapes and Morph Shapes) found. It also enables you to use Media-Extraction. Include Dummies For Bindable Classes creates and includes an AS file containing all bindable classes. This ensures that all such classes are known to the compiler and it will not add any bytes to the (re-)compiled result. [Style(name="somePROP")]<!--, inherit="yes"--> for MXML classes. [Style(name="somePROP", inherit="yes")] for both AS and MXML classes. Please refer to your Adobe Flex manual for further information.